Whistler Blackcomb Resort, Whistler, British Columbia, Canada previously a winner of FTF’s Top 10 Getaways for Family Travelers Award, gets a fresh look in 2015. 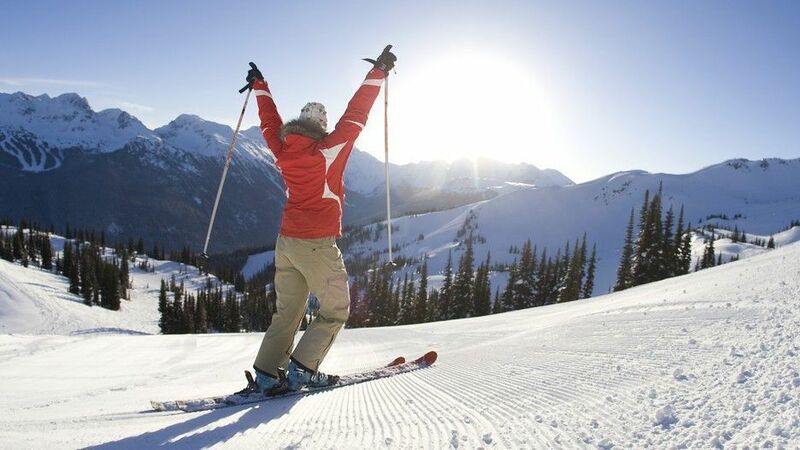 Located in British Columbia, Whistler Blackcomb is one of North America’s most popular recreational areas. With over 8,100 skiable acres between Whistler and Blackcomb Mountains (combined in 1997), this is the largest ski and snowboard resort on the continent. The 200-plus trails (about 20% for beginners and 55% intermediate) and variety of après ski entertainment keep it interesting for even the most intense winter sports enthusiast, who might never repeat a trail for a week! The Blackcomb side has the best kids’ terrain park we’ve seen, with plenty of fun and creative elements. On the down side, Whistler Blackcomb is so extensive, that unexpected fog or rain can occur at different elevations depending on the season. Often, when it’s inclement weather in the valley, it’s snowing on the mountains; after all, the mountains get blanketed by an average of 33 feet of snow in the winter. Hitting the slopes, however, is far from the only thing to do. Other winter activities for parents and kids together include ice skating, horse-drawn sleigh rides, dogsledding, snowshoeing, and heading to a more recent addition, the Coca Cola Tube Park. The Magic Castle on Blackcomb is a must-visit for families exploring on the mountains in the winter. Open daily, these play areas are a great spot for families to kick off their skis/boards and take a ‘play’ break in an outdoor wonderland. In bad weather, the thoughtfully planned layout and efficient base design make the condos seem a few steps away from the action-packed, faux European village. We found this car-free center so kid-friendly that children can roam freely. The summer months remain active at Whistler with four golf courses, mountain biking, alpine sightseeing tours, kayaking, canoeing, sailing, daily and nightly entertainment, and active children’s programs focusing on nature. The summer skiing and snowboarding on Horstman Glacier (including kids expert training camps) is unsurpassed. High-tech lifts allow access to an elevated alpine world for hiking, mountaineering and rock-climbing. For a day in the water, try swimming in one of five lakes or rafting on a nearby river. Also a huge family attraction is the Bike Park and Blackcomb Base Adventure Zone, open daily in the summer. The Adventure Zone offers fun for the whole familiy with Mario and Friends mini golf, Kiss the Sky Bungy Trampoline, the westcoaster luge, bungee castle, and spider web among others. Families can also enjoy galleries, restaurants, the Farmer’s Market (open on Sundays throughout the summer at the base of Blackcomb Mountain) and summer music festivals to rival Aspen’s. Whistler offers a wide variety of kids’ programs. In winter, even the tiniest family members have the chance to discover their own kind of fun. Infants and toddlers 18 months to school-age can attend daycare from 8am to 6:30pm ($95). After hours, Kids Night Out offers non-ski based activities at the base of Blackcomb Mountain in the Upper Village. Children ages 30 months to 5-years enjoy nature walks, visits to the fire hall, arts and crafts, story time and nap time along with sightseeing on the Peak 2 Peak gondola. Kids ages 5 on up can join ADventure Ski Camps and lessons for jam packed activities and fun with plenty of learning. Be sure to book all children’s programs early so as not to miss out on the fun. Year-round accommodations come in all styles from world-class hotels like the Fairmont Chateau Whistler to stylish condos and the new Whistler Village gondola cabins.. Whistler Blackcomb’s website features a vacation planner to help you compute lift tickets, equipment rental, air travel and other essentials for an overall vacation price. Also, visit www.tourismwhistler.com for a comprehensive calendar of events and information on Whistler.